With the shapes of the letters under our belt, it’s time to think about a calligraphy pen! Don’t forget that the pencil letters remain beautiful in their own right, and are always a great warm up exercise before you start writing with a pen. It is the use of a calligraphy pen (edged pen) that adds the gorgeous thicks and thins to our letters, making them look like the beautiful shapes we see in the historical documents. Have a look at the section Topics for All Learners - you'll find information on types of pens, and on setting up your pen to write. We’re actually going to start with a double pencil – which is simply 2 pencils taped together with their points level. The two pencils should be the same hardness (i.e. 2 HBs or 2 Bs etc). They are a bit cumbersome to write with, but are so useful for getting your head around how an edged pen works, that they are worth the trouble. Lefties : you may want to set one point slightly back from the other (by 1-2 mm). The “shorter” pencil should be on the left when you use it. The reason for this is that as you hold it in your left hand and bring the pencil points towards the paper, the two points end up arriving at the paper at the same moment without you having to twist your hand. This is why left handed nibs are cut at an angle, with the left hand edge of the nib being “shorter” than the right hand edge. 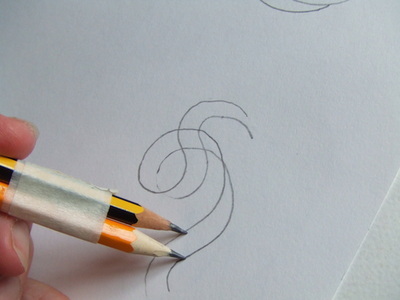 Have a try with the double pencil – swirls, lines, crosses, circles – anything you like. Don’t worry about letters yet. I suggest a big piece of paper as you’re likely to have more fun if you’ve plenty of room! Get used to the feel of the pencils in your hand. 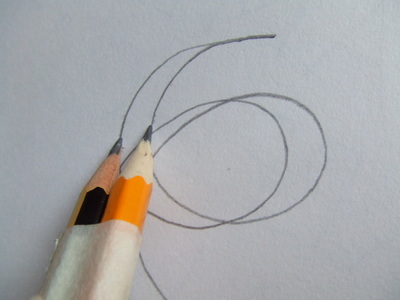 Do you find you’re tending to put more pressure onto one pencil than the other – possibly not always the same pencil? This is very common, and if you’re not aware of it, will cause problems with a pen. I know people who have been calligraphers for years who did not realise that they favour one corner of the pen (i.e. one pencil) over the other. Have another go, trying to get the same darkness of line out of each pencil. Have a look at your patterns – hopefully you can see some promising marks that might be calligraphic? When you are using the pencils, perhaps you are twisting them around in your hand? Or perhaps they’re always at the same angle to each other? When we’re writing calligraphy, we (nearly) always want the pencils to be at the same angle to each other, not twisting around each other like a couple of ballroom dancers! 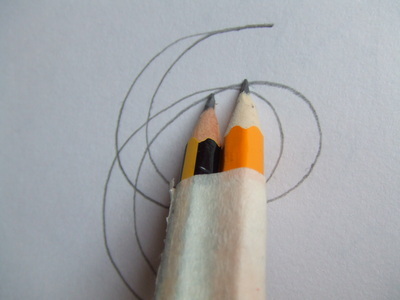 When the pencil points are side by side on a horizontal line on your page, we say they’re at 0 degrees. With the pencils in this position, try drawing a cross, made of one vertical stroke and one horizontal stroke. You should find that the vertical stroke has the two pencil lines the full distance apart, and that the horizontal stroke appears to be a single line, because both pencil points have travelled over the same place on the paper. If you didn’t get that result, have another try. Now try holding the double pencil so that the two points are side by side on a vertical line. We say they are at 90 degrees. Try the same shape of cross – this time the horizontal stroke should be fattest, and the vertical stroke thinnest. Using your protractor, draw a line at 45 degrees to the horizontal on your page, and put both the pencil points on this line. Maintaining that 45 degree positioning of the pencils, draw the same shape of cross. What do you notice about the vertical and horizontal strokes this time? You should see that the two pencil lines in the vertical stroke are the same distance apart as the two pencil lines in the horizontal stroke. If that wasn’t the case, have another try. Now with the pencils at that 45 degree angle, try some more swirls and circles, and practice not letting the two pencils twist around each other. Now all this that we’ve learnt with a pencil applies to a pen too. Why not grab a calligraphy pen (could be a felt tip, a cartridge pen, or a dip pen – doesn’t matter). Have a go at the crosses we created with the pencil, but using the pen instead. 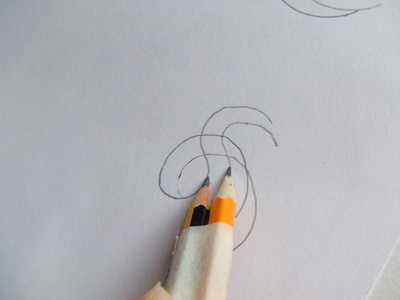 And with the pen at 45 degrees, have a go at swirls, circles, anything you fancy. Remember to think about keeping the pressure equal on the two corners of the pen, just like we did with the pencil. And make sure you’re not twisting the pen in your hand – should be 45 degrees all the time. Important : If you’re choosing to use your dip pen – that’s great news!! There’s plenty of help on how to set your dip pen up and get it writing, in the Topics For All Learners section, so have a read. It can be tricky to get them writing well in the first place, but it is worth the trouble as they’re such good writing instruments. If you’re struggling with getting it to write well, then please be assured that this is quite usual, and if you tell me what’s happening, I’ll work with you to sort it out. 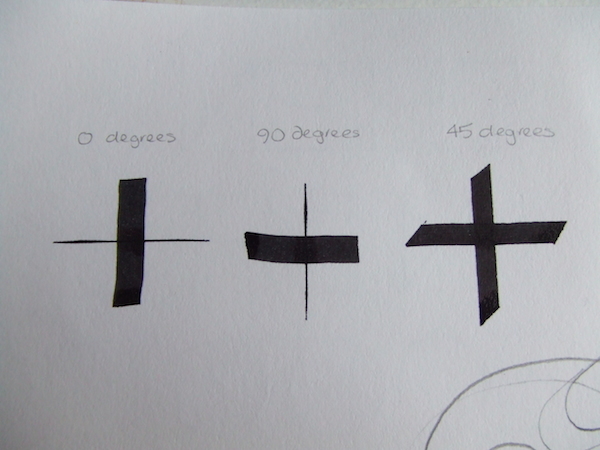 When you’re ready, scan/photo your crosses that you’ve done with the pen, labelled 0 degrees, 90 degrees and 45 degrees, along with a sample of your pattern making with the pen at 45 degrees, for submission later. Tea break! After the excitement of making some real calligraphic marks, let your brain have a little rest. (Bet you tried some letters with your pen already though? Well that's excellent - if you weren't interested in writing letters with a calligraphic pen, you probably wouldn't have chosen to do this course, would you? Now we’ve been making confident calligraphic marks with the pen, it’s time to have a go at some letters. Take your double pencil and measure the distance between the points. I find it easiest to use the double pencil to draw a double line, then measure between the pencil lines. Multiply this distance by 5, and rule 2 horizontal lines this new distance apart across your page. (The lines will probably be around 4cm apart, but it will vary per person). Now draw a line at 45 degrees to the horizontal. Line your pencil points up on the 45 degree line. 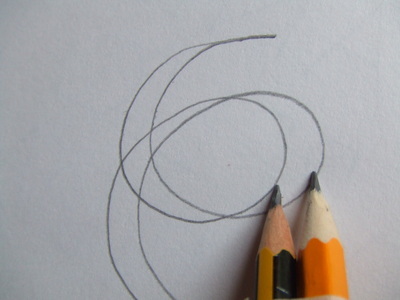 Have a go at writing the letter O, focussing on the left hand pencil, making that shape we learnt, remembering to start at 11 o’clock on the clock face and construct it in 2 strokes. AND you need to maintain the 45 degree angle of your pencils. I’m not saying it’ll work perfectly first time, but what you should end up with is the O shape we learnt drawn by the left hand pencil, and another identical shape drawn by the right hand pencil. In this picture, the left hand pencil was grey and the right hand pencil was red. If you look at the grey o, it's just like we were doing with a pencil. And the red o is also just as we were doing with the pencil. But together they make a shape that has thicks and thins - just what we think of as calligraphy! Keep practicing this, and also make sure that the shape is fitting between the two lines you drew – to achieve this the shape made by the left hand pencil will touch the bottom line, but not the top line (only the right hand pencil will touch the top line). Now we’re going to have a go at the letter N.
Again, it’s 45 degrees all the way. Look at the shape at the start and end of the letter – this is called a serif, and is both decorative and helpful in getting the ink flowing in your pen as you write a letter. Again, only the left hand pencil (grey) will touch the bottom line, and only the right hand pencil (red) will touch the top line. Now give it a try – it should feel easier than the O because you don’t have the challenge of making the 2 strokes join up at 5 o’clock like on the O. Once this feels OK, choose a calligraphy pen (bigger will be better at this stage). Measure the width of the nib, multiply by 5, and rule 2 lines that distance apart. Remembering the 45 degree angle, have a go at writing some Os and Ns. 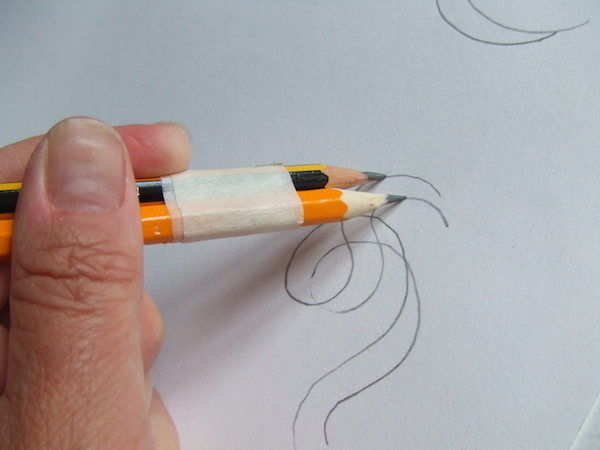 These are tricky exercises – but very helpful for understanding what your pen is doing.... I think it’s worth a little pain!! written once with the double pencils, and then again with the pen of your choosing.